Big musical. Big comedy. Big hair. It’s 1962 Baltimore, where the ‘50s are out – and change is in the air. 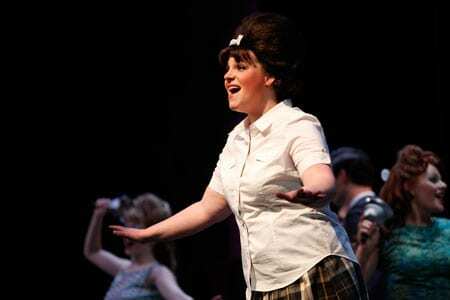 Loveable plus-size heroine Tracy Turnblad has a passion for dancing and wins a spot on the local TV dance program. Overnight she finds herself transformed from outsider to teen celebrity. Can a larger-than-life adolescent manage to defeat the program’s reigning princess, integrate the television show, and find true love (singing and dancing all the while, of course!) without mussing her hair? A winner of eight Tony Awards, including Best Musical. Performances held at the Deb Fennell Auditorium, 9000 SW Durham Road, Tigard. Run time: 2 hours and 30 minutes. Order a 4-show flex pass to see Hairspray, Ripper, I Love You Because and PDX-MAS and save 10% off the price of individual premier tickets! Click here to order. Blythe Woodland (Tracy Turnblad) is very excited to be making her Portland-area acting debut at Broadway Rose Theatre Company in Hairspray. Some of her favorite theater credits have been Lucy in Jekyll & Hyde, Aida in Aida, Madame Thenardier in Les Misérables, and Anita in West Side Story. 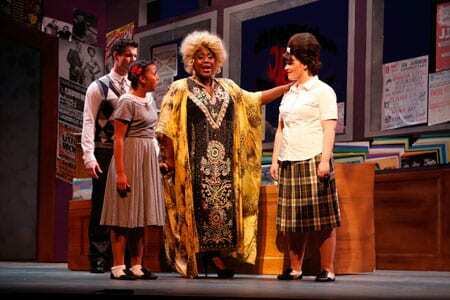 She has also appeared in productions of Grease, Children of Eden, Music Man, and Seussical the Musical. Blythe is originally from the Bay Area in California and has enjoyed getting involved with the Oregon theater community. Dan Murphy (Edna Turnblad) is the founding general manager of Broadway Rose. Broadway Rose performance highlights include Hennessey/Captain in Dames at Sea, Courtly DeManor in The Case of the Dead Flamingo Dancer, Vernon in They’re Playing Our Song, Phil in Flaming Idiots, and appearing in The Melody Lingers On: The Music of Irving Berlin. More recent credits around town are Maurice in Disney’s Beauty and the Beast for Pixie Dust Productions and Farmer Brown in Click Clack Moo: Cows That Type for Oregon Children’s Theatre. Steven Bryan Dawson (Link Larkin) is very excited to be returning to Broadway Rose yet again, this time as teenage heart-throb Link Larkin. You may remember him at Broadway Rose as the fun loving Al in A Chorus Line or as the Butler and Judah in Joseph and the Amazing Technicolor Dreamcoat. After years on the stage, including three in the Portland area, Steven will move to the other side of the curtain this fall and attend American University in Washington, D.C. for his Master’s degree in Arts Management. 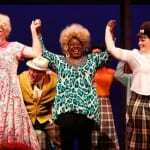 Lacretta Nicole (Motormouth Maybelle) is over the moon to be a part of Hairspray! Selected regional credits include A Wrinkle in Time (Coterie), All Shook Up (FRP), Ragtime (Portland Center Stage), Xanadu (Barter). Opera: Carmen (Carmen), Gianni Schicchi (Zita), The Theory of Everything (Nightclub Singer, Pa’qo). Guest Soloist: Hendersonville Symphony Orchestra. Readings/Workshops: Disaster! The Musical (Seth Rudetsky), This One Girl’s Story (Gayfest), Bathory (D. Levinson), and Street Lights (Joe Drymala). Sara Catherine Wheatley (Velma Von Tussle) is so thrilled to be back onstage at Broadway Rose this summer. You may remember her in past BRTC productions as Dorothy Flynn in Nite Club Confidential and as Patsy in Always…Patsy Cline. Other favorite Portland credits include Olive Ostrovsky in The 25th Annual Putnam County Spelling Bee, Candy Starr in One Flew Over the Cuckoo’s Nest, and Ensemble/Mother Understudy in Ragtime (Portland Center Stage); Ulla in The Producers (Lakewood); Rock Alice in Alice & Wonderland: A Rock Opera (Oregon Children’s Theatre); Babette in Disney’s Beauty and the Beast (Pixiedust Productions); and Cathy in The Last Five Years (Stumptown Stages). Sara Catherine hails from Alabama where she earned a Bachelor’s degree in theater from The University of Alabama. She now proudly calls Portland home. Alina Ziak (Amber Von Tussle) is thrilled to be returning to the Broadway Rose stage after her Les Misérables debut in 2008. Recent productions include Alice & Wonderland: A Rock Opera (Red Queen) with Oregon Children’s Theatre and RENT (Maureen) with Stumptown Stages. When she is not pursuing theater, you can find her chasing after a perfect two year-old (Mommy loves you Prince Dacian! ), dancing & karaoke-ing it up with her theater family, reading, snuggling with pookie, or enjoying the great outdoors. Alina holds an A.A. degree from Mt. Hood Community College, a B.F.A. 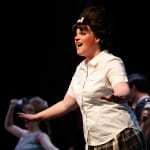 in musical theater from New School University, and has completed the musical theater certification program at A.M.D.A. Norman Wilson (Corny Collins) could not be more delighted to make his Broadway Rose debut in this fun show. Since moving to Portland two years ago from Long Beach, California, Norman has had the pleasure of performing with several great companies throughout the Portland area. Favorite roles include Madame George in the world premier of Find Me Beside You, Lucentio in The Taming of the Shrew, Brindsley in Black Comedy, Charlie in Tintypes, Jack Gable in Leading Ladies and Sparky in several productions of Forever Plaid. Ron Daum (Wilbur Turnblad) appeared in Broadway Rose’s second season as Ike Skidmore in Oklahoma! and has returned to be seen at Broadway Rose as Poole in Jekyll & Hyde, Alan in Baby, Bert in 42nd Street, Rudolph in Hello, Dolly!, Clem in The Will Rogers Follies, Roscoe Dexter in Singin’ in the Rain, Amos (Mr. Cellophane) Hart in Chicago and in Some Enchanted Evening and the ensembles of Evita and Hello, Dolly! He also directed the children’s theater productions of Hansel and Gretel and Silly Goose (which he co-authored). John “Jay” Kelley Jr. (Seaweed J. Stubbs). Born in New York City and raised in the South, singing has always been a part of his daily life. 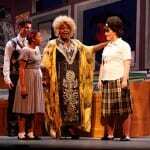 He attended Northwest School of the Arts in Charlotte, North Carolina and was a part of several productions at the Blumenthal Performing Arts Center such as; Thoroughly Modern Millie (Trevor Graydon III) and Hair (Hud Johnson). Jay attends the University of North Carolina Pembroke where he performed in Godspell (Jesus). This spring Jay will transfer to Berklee College of Music where he will continue his musical studies. Peggy Taphorn (Director) is currently the producing artistic director of the Temple Theatre in Sanford, North Carolina. In the past four seasons she has produced over 50 plays, musicals, special events and children’s shows, many which she directed/choreographed and/or performed in as well. Peggy is thrilled to once again be a part of the Broadway Rose Theatre tradition, having previously directed and choreographed Dames At Sea, Singin’ In The Rain, 42nd Street & Chicago – for which she won a best actress Drammy for her portrayal of Velma. Peggy holds a B.F.A. in musical theater from the Conservatory at Webster University. Shortly after moving to New York from Belleville, IL, she was discovered by legendary showman George Abbott and starred on Broadway in his revival of Broadway! Other Broadway shows followed including the Tony award-winners Me And My Girl, Showboat, Smokey Joe’s Café and Urinetown. Peggy has done numerous national tours including: Company, Little Women, starring Maureen McGovern, and she left the national tour of Sweet Charity starring Molly Ringwald to helm the Temple Theatre. Off-Broadway credits include: Johnny Guitar, No, No Nanette, The Gay Divorce, and The Space. Peggy has performed on London’s West End and toured Canada, South America and the far east where she portrayed Velma in Chicago in Macao, China, the first “book musical” ever produced in the region. Here’s a sampling of other regional credits: Sweet Charity, Damn Yankees, A Chorus Line, Quilters, Dreamgirls, My Way, Beguiled Again, World Goes ‘Round, Swing, Anything Goes, Grand Hotel, Cabaret, She Loves Me, Lend Me A Tenor, My Fair Lady, Most Happy Fella, Bye, Bye Birdie and numerous others. She has sung at such prestigious N.Y.C. venues as: The Rainbow Room, The Russian Tea Room, Tavern On The Green, Danny’s Skylight Room and The Hudson River Club to name a few. Her directing/choreographic work has been seen from coast to coast in the United States, as far north as Canada and as far east as Singapore. She is delighted to now be a NC resident. For more information please check out the Temple Theatre website: www.templeshows.com. Jacob Toth (Choreographer). Previously at Broadway Rose: Singer/Dance Captain, The Melody Lingers On. Elsewhere: As a Choreographer: Broadway: Assistant Choreographer, Grease. 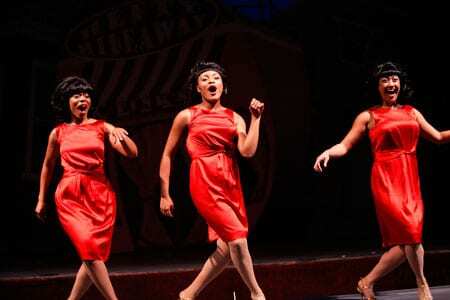 Regional: The Marvelous Wonderettes, Altar Boyz, Dreamgirls, The Pajama Game, Beauty and the Beast, 42nd Street, King and I, Crazy For You, among others. As an actor: International Tour: FOSSE w/Ben Vereen and Ruthie Henshall, National Tour: Barry Mannilow’s Copacabana. Regional: Joseph and the Amazing Technicolor Dreamcoat, The Full Monty, Evita, A Chorus Line, among others. Rick Lewis (Music Director). Broadway Rose shows: Musical Director: I Left My Heart: A Salute to the Music of Tony Bennett, Joseph and the Amazing Technicolor Dreamcoat, Jekyll & Hyde, Little Shop of Horrors, Bye Bye Birdie, They’re Playing our Song, The Taffetas and Taffeta Christmas. 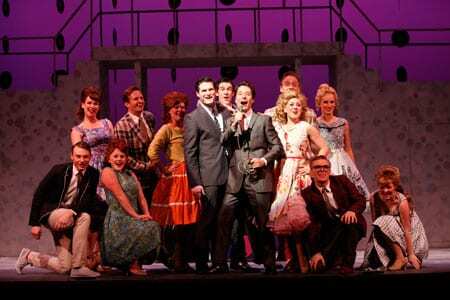 Director: Forbidden Broadway, How to Succeed in Business Without Really Trying. Actor: Pete ‘n’ Keely (Pete), Lucky Stiff (Witherspoon), Flaming Idiots (Carl). Conductor/musical director for Portland Center Stage’s Sunset Boulevard, Ragtime (Drammy & PAMTA, Musical Direction), 25th Annual Putnam County Spelling Bee, Bat Boy, The Fantasticks, West Side Story (Drammy), Cabaret, Guys and Dolls (Drammy) A Christmas Carol (Composer). Rick is the author/musical arranger of the hit Off-Broadway musicals The Taffetas, and The Cardigans (NY Bistro Award, Outstanding Musical Revue), and Have a Nice Day! Composer/Arranger for Disney Family Live Entertainment, MGM/UA Home Video, Democratic National Convention, Macy’s Thanksgiving Day Parade, American West Steamboat Company, American Hawaii and American Classic Voyages. Rick is a private vocal coach for musical theater performers. Rlewismusic.com. 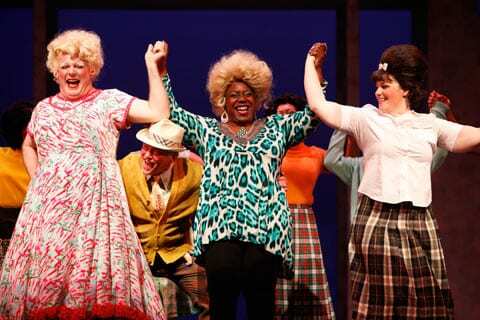 For sheer energy and enthusiasm, there’s no stopping Broadway Rose Theatre Company’s summer production of the musical hit Hairspray…this ranks as one of the strongest shows in Broadway Rose’s 20-year history, a testament to how this once-small company has evolved into a bankable force in the Portland-area’s theater scene…Read the rest here. …the show is a real joy: a loud, exuberant tribute to loving yourself as you are, with infectious energy and an immediately memorable score—including “You Can’t Stop the Beat,” by far the best finale in recent memory…Read the rest here. …The talent of the cast was remarkable. They had a live pit orchestra, directed by the Rick Lewis (who has been the music director for some of my favorite productions at Portland Center Stage). And it was just a powerhouse production. I was so into it, I was kinda bummed when intermission hit…Read the rest here. Peggy Taphorn returns to Tigard to direct this time around. Taphorn has spent most of her career either on Broadway or doing national tours, and fate has nudged her along several times by putting her in the right place at the right time…Read the rest here. 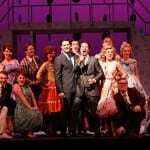 Broadway Rose Theatre Company is Oregon’s premier musical theatre company, professionally producing Broadway musicals, comedies, and revues in Tigard, Oregon since 1992. Our mission is to create unparalleled musical theatre experiences that invigorate audiences and enrich our communities. Learn more.